Creative Dynamo Network ‘ecotainment’ – Creative Dynamo Ecotainment! I have just returned from Respect Fest a free one-day family event in Poole. I was booked by Poole Housing Partnership to provide recycling and renewable energy themed activities or ‘ecotainment’. 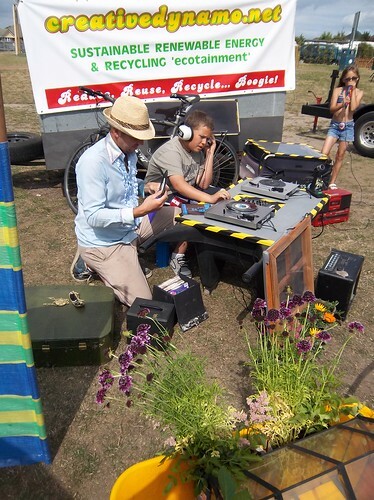 This included Tip of the Pops the only solar powered wheelbarrow disco made from waste in the world ever! PLUS a recycled solar oven made from card and aluminium foil, a guerilla garden (also in wheelbarrow), dynamo bike beat box cycle, solar powered PA for the event arena & one less car a bicycle & trailer housing a small scale solar system. This event was a technical, logistical & creative leap for the project as I am nearing the end of my UNLTD funding phase and wanted to showcase some of the achievements. Firstly I was using three separate solar systems; one in the camper van that was providing a public address system (music and microphone) for the main arena. This included Scottish and Disco dancing from audio cassette and compact disc. Then there was the Tip of the Pops wheelbarrow disco which has been re-built after two years of touring. Earwig (the barrow) has benefited from a ‘hazard tape’ & paint make-over, Numark mixer, and reclaimed ‘window sill’ solar panel. The final solar system was housed in a cycle trailer and called One Less Car. The trailer has a perspex top clearly showing the layout / circuit of the battery and terminals making up the solar system. All three systems have the same basic components so I had the idea of using my everyday bike and trailer to show exactly how a basic solar system is built. What’s more one less car powered a red voice changing SFX microphone and Panasonic ghetto blaster for kids to play along with. 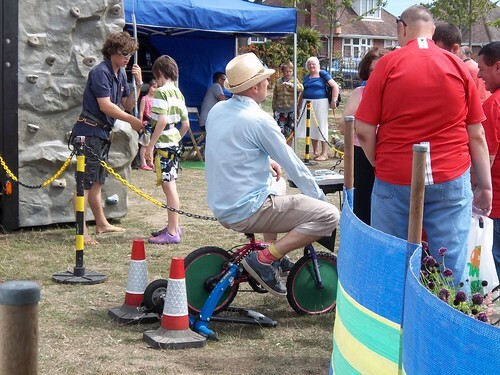 Renewable also meant using pedal power for the first time at Respect Fest. The Dynamo Bike Beat Box is a childs bicycle generating 12 volt electricity to power toys or anything else for that matter. I had found the toy (DJ Mix Me) and cycle trainer (Trax) a long time ago but lacked the experience necessary to adapt the generator. In the end I recruited volunteers (also from the recycling centre) to help me achieve this and it worked perfectly. Now that the cycle generator is built there are some improvements that I can do to make it easier to use – thank you so much to Frank for building this at such short notice! The Recycled Solar Oven consists of cardboard and tin foil that is so simple to make that it can be done in an afternoon. The solar oven panels reflect sun rays into a cooking chamber which can reach temperatures up to 100 degrees centigrade. 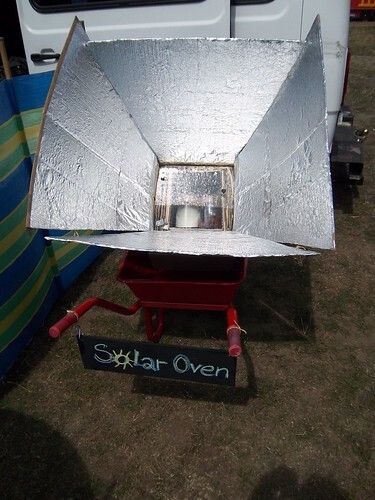 However the solar oven requires 2-3 hours of direct sunlight with no cloud cover to actually boil / cook food and can only be used effectively in the UK during summer months. The final demonstration was a guerilla garden wheelbarrow with plants in cereal boxes around a small greenhouse. This was showing that you do not need a lot of space to garden or need any special equipment to get started. Next up I am visiting Turlin Moor, Poole on the 7th August and on the following day, Gaunts House, Wimborne, for their Summer Gathering (5th – 8th) August. Turlin Moor is free entry & at Gaunts you may purchase a ticket for more information see their website. For further information and bookings please do not hesitate to contact me on this site.